J. D. Tippit (September 18, 1924 – November 22, 1963) was an American police officer who was an 11-year veteran with the Dallas Police Department. About 45 minutes after the assassination of President John F. Kennedy on November 22, 1963, Tippit was shot dead in a residential neighborhood in the Oak Cliff section of Dallas. Lee Harvey Oswald was initially arrested for the murder of Tippit and was subsequently arrested for the killing of President Kennedy. Oswald was charged with both crimes shortly after his arrest. However, Oswald denied involvement in either of the cases. Because Oswald was shot and killed by nightclub owner Jack Ruby two days after the killings, he could not be prosecuted for either. Tippit was born near the town of Annona in Red River County, Texas. He was the eldest of seven children (two girls and five boys) to Edgar Lee Tippit (1902–2006), a sharecropper cotton farmer, and Lizzie Mae "May Bug" Tippit (née Rush; 1905–1990). The Tippit and Rush families were of English ancestry, their ancestors having immigrated to Virginia from England by 1635. It is sometimes reported that J. D. stood for "Jefferson Davis", but in fact, the letters did not stand for anything. Tippit attended public schools through the tenth grade and was raised as a Baptist, a faith he practiced for the rest of his life. In the fall of 1939, when he was 15, his family moved to Baker Lane, a stretch of dirt road six miles southwest from Clarksville. He entered the United States Army on July 21, 1944, and was assigned to the 513th Parachute Infantry Regiment of the US 17th Airborne Division. He saw combat in Operation Varsity, the airborne crossing of the Rhine River in March 1945, earning a Bronze Star, and remained on active duty until June 20, 1946. Tippit married his high school sweetheart, Marie Frances Gasway, on December 26, 1946. The couple had three children: Charles Allan (born 1950), Brenda Kay (born 1953) and Curtis Glenn (born 1958). That same year, he went to work for the Dearborn Stove Company. He next worked for Sears, Roebuck and Company in the installation department from March 1948 to September 1949 when he was laid off. The couple moved to Lone Star, Texas, where Tippit attempted to farm and raise cattle. In January 1950, Tippit enrolled in a Veterans Administration vocational training school at Bogata, Texas. He left the school in June 1952. After facing several setbacks as a farmer and rancher, Tippit decided to become a police officer. The Tippit family then moved to Dallas where Tippit was hired by the Dallas Police Department as a patrolman in July 1952. During his time with the Dallas Police Department, Officer Tippit was cited twice for bravery. At the time of his death, Tippit was assigned to Dallas Police vehicle #10, had badge #848 and was earning a salary of $490 a month (worth $4,010 in 2015) as a Dallas police officer. He was also working two part-time jobs; he worked at Austin's Barbecue restaurant on Friday and Saturday nights and at the Stevens Park Theatre on Sundays. On November 22, 1963, J. D. Tippit was working beat number 78, his normal patrol area in south Oak Cliff, a residential area of Dallas. At 12:45 p.m., 15 minutes after Kennedy was shot, Tippit received a radio order to drive to the central Oak Cliff area as part of a concentration of police around the center of the city. At 12:54, Tippit radioed that he had moved as directed. By then several messages had been broadcast describing a suspect in the killing of Kennedy as a slender white male, in his early thirties, 5 feet 10 inches (1.78 m) tall, and weighing about 165 pounds (75 kg). Oswald was a slender white male, 24 years old, 5 feet 9 inches (1.75 m) tall, and an estimated weight of 150 pounds (68 kg) at autopsy. At approximately 1:11–1:14 p.m., Tippit was driving slowly eastward on East 10th Street — about 100 feet (30 m) past the intersection of 10th Street and Patton Avenue — when he pulled alongside a man who resembled the police description. Oswald walked over to Tippit's car and apparently exchanged words with him through an open vent window. Tippit opened his car door and as he walked toward the front of the car, Oswald drew his handgun and fired four shots in rapid succession. One bullet hit Tippit in the chest, one in the stomach, another in his right temple (one bullet hit a button and did not penetrate his skin). Tippit's body was transported from the scene of the shooting by ambulance to Methodist Hospital, where he was pronounced dead at 1:25 p.m. by Dr. Richard A. Liguori. A short time later, Hardy's shoe store manager Johnny Brewer observed Oswald acting suspiciously as police cars passed nearby with sirens blaring. Oswald then ducked into the Texas Theatre without purchasing a ticket. The police were notified by the theater's cashier and responded by surrounding the theater. Oswald was arrested after a brief struggle. Twelve people who witnessed the shooting or its aftermath were mentioned in The Warren Report. Domingo Benavides saw Tippit standing by the left door of his parked police car, and a man standing on the right side of the car. He then heard shots and saw Tippit fall to the ground. Benavides stopped his pickup truck on the opposite side of the street from Tippit's car. He observed the shooter fleeing the scene and removing spent cartridge cases from his gun as he left. Benavides waited in his truck until the gunman disappeared before assisting Tippit. He then reported the shooting to police headquarters, using the radio in Tippit's car. Helen Markham witnessed the shooting and then saw a man with a gun in his hand leave the scene. Markham identified Lee Harvey Oswald as Tippit's killer in a police lineup she viewed that evening. Barbara Davis and her sister-in-law Virginia Davis heard the shots and saw a man crossing their lawn, shaking his revolver, as if he were emptying it of cartridge cases. Later, the women found two cartridge cases near the crime scene and handed the cases over to police. That evening, Barbara Davis and Virginia Davis were taken to a lineup and both Davises picked out Oswald as the man whom they had seen. Taxicab driver William Scoggins testified that he was sitting nearby in his cab when he saw Tippit's police car pull up alongside a man on the sidewalk. Scoggins heard three or four shots and then saw Tippit fall to the ground. As Scoggins crouched behind his cab, the man passed within twelve feet of him, pistol in hand, muttering what sounded to him like, "poor dumb cop" or "poor damn cop." The next day, Scoggins viewed a police lineup and identified Oswald as the man whom he had seen with the pistol. The Commission also named several other witnesses who were not at the scene of the murder, but who identified Oswald running between the murder scene and the Texas Theatre, where Oswald was subsequently arrested. Four cartridge cases were found at the scene by eyewitnesses. It was the unanimous testimony of expert witnesses before the Warren Commission that these spent cartridge cases were fired from the revolver in Oswald's possession to the exclusion of all other weapons. Upon his arrest and during subsequent questionings by police, Lee Harvey Oswald denied any involvement in Tippit's murder. Based on eyewitness' statements and the gun found in Oswald's possession at the time of his arrest, he was formally charged with the murder of J. D. Tippit at 7:10 pm. on November 22. During the course of the day, police began to suspect that Oswald was also involved in the shooting of President Kennedy. At approximately 1:00 am on November 23, Oswald was also charged with assassinating President John F. Kennedy. Oswald continued to maintain his innocence in connection with both murders. In the late morning of November 24, while being transported from the Dallas City Jail to the Dallas County Jail, Oswald was fatally shot in the abdomen by Dallas nightclub owner Jack Ruby. The shooting was broadcast throughout the United States and Canada on live television. As Oswald was killed before he was tried for either crime, President Lyndon B. Johnson commissioned a committee of U.S. Senators, Congressmen and elder statesmen to investigate the events surrounding the deaths of President Kennedy, Officer Tippit and Oswald in an effort to answer questions surrounding the events. President Johnson also hoped to quell rumors that arose after Oswald was shot by Jack Ruby that the assassination and subsequent shootings were part of a conspiracy. The committee, known as the Warren Commission (named for the commission chairman, Chief Justice Earl Warren), spent ten months investigating the murders and interviewing witnesses. On September 24, 1964, the Warren Commission released an 888-page report that concluded there was no evidence of a conspiracy and Lee Harvey Oswald acted alone in killing President Kennedy and Officer Tippit. The report also concluded that Jack Ruby acted alone in the killing of Lee Harvey Oswald. In 1979, the House Select Committee on Assassinations reported: "Based on Oswald's possession of the murder weapon a short time after the murder and the eyewitness identifications of Oswald as the gunman, the committee concluded that Oswald shot and killed Officer Tippit." Some conspiracy theorists have alleged that the murder of Officer Tippit was part of a conspiracy to kill President Kennedy. Implying that two murders could not have happened so closely together by coincidence, his killing is often referred to as the "Rosetta Stone" to the solution of the Kennedy assassination by critics of the official findings. Some critics dispute that Oswald shot Tippit, arguing that the physical evidence and witness testimony do not support that conclusion. Other critics state that Tippit himself was a conspirator, tasked to kill Oswald by organized crime or right-wing politicians in order to cover up the search for other assassins. On the evening of the assassination, both Attorney General Robert F. Kennedy and the new President, Lyndon B. Johnson, called Tippit's widow to express their sympathies. Jacqueline Kennedy wrote a letter expressing sorrow for the bond they shared. The plight of Tippit's family also moved much of the nation and a total of $647,579 was donated to them following the assassination. One of the largest individual gifts was $25,000 that Dallas businessman Abraham Zapruder donated to Frances Tippit after selling his film of the president's assassination to Life magazine. A funeral service for J. D. Tippit was held on November 25, 1963, at the Beckley Hills Baptist Church, with the burial following at Laurel Land Memorial Park in Dallas. His funeral was held on the same day as those of both President Kennedy and Lee Harvey Oswald. In January 1964, Tippit was posthumously awarded the Medal of Valor from the American Police Hall of Fame, and he also received the Police Medal of Honor, the Police Cross, and the Citizens Traffic Commission Award of Heroism. 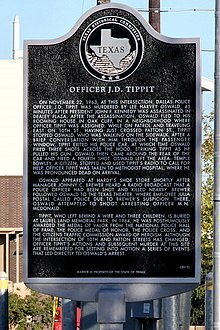 A state historical marker to Officer Tippit was unveiled November 20, 2012 at the location where the shooting occurred. Tippit's widow married Dallas police lieutenant Harry Dean Thomas in January 1967. They were married until his death in 1982. Marie Tippit later married Carl Flinner; the marriage ended in divorce after which Marie resumed using the surname of Tippit. In films, Tippit has been portrayed by Price Carson in 1991's JFK, and David Duchovny in 1992's Ruby. He was also portrayed by Matt Micou in the 2013 television drama Killing Kennedy. ^ "Texas Historic Sites Atlas". Texas Historical Commission. Archived from the original on July 13, 2012. Retrieved August 23, 2014. ^ a b c Kalthoff, Ken. "Dallas to mark 50th anniversary of JFK's assassination with memorial ceremony - U.S. News". Usnews.nbcnews.com. Archived from the original on January 28, 2013. Retrieved February 7, 2013. ^ a b c d Investigation of the Assassination of President John F. Kennedy: Hearings Before the President's Commission on the Assassination of President Kennedy, Volume 26. 26. U.S. Government Printing Office. 1964. p. 485. ^ "J. D. Tippit". Find A Grave. ^ a b "Edgar Lee Tippit". Find A Grave. ^ a b "BIOGRAPHY: 1924-1943". jdtippit.com. ^ a b Myers, Dale K. (1998). With Malice: Lee Harvey Oswald and the Murder of Officer J.D. Tippit. Milford, Mich.: Oak Cliff Press. ISBN 0-9662709-7-5. ^ a b c d e Granberry, Michael (January 27, 2004). "Pain lingers for Tippit's widow". dallasnews.com. Retrieved October 3, 2014. ^ Skordas, Gust (1968). The Early Settlers of Maryland: An Index To Names of Immigrants Compiled From Records of Land Patents, 1633–1680. The Hall of Records, Annapolis, Maryland: Genealogical Publishing Co. p. 465. ^ Bugliosi, Vincent (2007). Reclaiming History: The Assassination of President John F. Kennedy. W. W. Norton & Company. p. 66. ISBN 0-393-07212-6. ^ Dooley-Awbrey, Betty. Why Stop? : A Guide to Texas Roadside Historical Markers. Rowman & Littlefield. p. 93. ISBN 1-58979-789-2. ^ Investigation of the Assassination of President John F. Kennedy: Hearings Before the President's Commission on the Assassination of President Kennedy, Volume 26. 26. U.S. Government Printing Office. 1964. p. 488. ^ Russo, Gus; Moses, Harry (2013). Where Were You? : America Remembers the JFK Assassination. Brokaw, Tom. Globe Pequot. p. 41. ISBN 1-4930-0189-2. ^ Appleton, Roy (November 2, 2013). "For slain officer J.D. Tippit's family, 'normal' life gone in a flash". dallasnews.com. Retrieved August 15, 2014. ^ Bugliosi, Vincent (2008). Four Days in November: The Assassination of President John F. Kennedy. W. W. Norton & Company. p. 507. ISBN 0-393-07203-7. ^ a b The first report of Tippit's shooting was transmitted over Police Channel 1 some time between 1:16 and 1:19 p.m., as indicated by verbal time stamps made periodically by the dispatcher. Specifically, the first report began 1 minute 41 seconds after the 1:16 time stamp. Before that, witness Domingo Benavides could be heard unsuccessfully trying to use Tippit's police radio microphone, beginning at 1:16. Dale K. Myers, With Malice: Lee Harvey Oswald and the Murder of Officer J.D. Tippit, 1998, p. 384. ISBN 0-9662709-7-5. ^ "Chapter 4: The Assassin". Report of the President's Commission on the Assassination of President John F. Kennedy. Washington, D.C.: United States Government Printing Office. 1964. p. 165. ^ "Chapter 1: Summary and Conclusions". Report of the President's Commission on the Assassination of President John F. Kennedy. Washington, D.C.: United States Government Printing Office. 1964. p. 5. ^ Report of the President's Commission on the Assassination of President John F. Kennedy, Chapter 4 1964, p. 144. ^ Oswald was 5 feet 9 inches (1.75 m) tall and weighed 150 pounds (68 kg). Warren Commission Hearings Vol. XXVI, p. 521. ^ Report of the President's Commission on the Assassination of President John F. Kennedy, Chapter 1 1964, p. 7. ^ Warren Commission Hearings, vol. 19, p. 113, Barnes Exhibit A, Right side of Tippit squad car, showing open wing vent window. Mrs. Markham was on the opposite side of the street and a half block back. ^ Report of the President's Commission on the Assassination of President John F. Kennedy, Chapter 1 1964, pp. 7-8. ^ By the evening of November 22, five of them (Helen Markham, Barbara Davis, Virginia Davis, Ted Callaway, Sam Guinyard) had identified Lee Harvey Oswald in police lineups as the man they saw. A sixth (William Scoggins) did so the next day. Three others (Harold Russell, Pat Patterson, Warren Reynolds) subsequently identified Oswald from a photograph. Two witnesses (Domingo Benavides, William Smith) testified that Oswald resembled the man they had seen. One witness (L.J. Lewis) felt he was too distant from the gunman to make a positive identification. Warren Commission Hearings, CE 1968, Location of Eyewitnesses to the Movements of Lee Harvey Oswald in the Vicinity of the Tippit Killing. ^ Warren Commission Hearings, vol. 6, Testimony of Domingo Benavides. ^ Warren Commission Hearings, vol. 3, p. 305, Testimony of Mrs. Helen Markham. ^ Warren Commission Hearings, vol. 3, p. 318, Testimony of Helen Markham. ^ Warren Commission Hearings, vol. 3, p. 342, Testimony of Mrs. Barbara Jeanette Davis. Warren Commission Hearings, vol. 6, p. 454, Testimony of Mrs. Charlie Virginia Davis. ^ Warren Commission Hearings, vol. 3, pp. 322–27, Testimony of William W. Scoggins. ^ Johnson, Scott P. (2013). The Faces of Lee Harvey Oswald: The Evolution of an Alleged Assassin. Lexington Books. p. 9. ISBN 0-7391-8682-5. ^ Warren Commission Report, pp. 166–169. Warren Commission Hearings, vol. 23, p. 817, CE 1968, Location of eyewitnesses to the movements of Lee Harvey Oswald in the vicinity of the Tippit killing. ^ Report of the President's Commission on the Assassination of President John F. Kennedy, Chapter 1 1964, p. 8. ^ Warren Commission Report, Appendix 10: Expert Testimony, Revolver Cartridges and Cartridge Cases. ^ The Warren Commission (2003). The Warren Commission Report. Barnes & Noble Publishing. p. 16. ISBN 0-7607-4997-3. ^ Siracusa, Ph.D., Joseph M. (2012). Encyclopedia of the Kennedys: The People and Events That Shaped America. ABC-CLIO. p. 619. ISBN 1-59884-539-X. ^ a b Rivera, Sheila (2010). Assassination of John F. Kennedy. ABDO Publishing Company. pp. 34–36. ISBN 1-61786-104-9. ^ Coleman, William Thaddeus (2010). Counsel for the Situation: Shaping the Law to Realize America's Promise. Bliss, Donald T. Brookings Institution Press. p. 175. ISBN 0-8157-0494-1. ^ Oliver, Willard; Marion, Nancy E. (2010). Killing the President: Assassinations, Attempts, and Rumored Attempts on U.S. Commanders-in-Chief. ABC-CLIO. p. 127. ISBN 0-313-36475-3. ^ Knight, Peter (2007). The Kennedy Assassination. Univ. Press of Mississippi. p. 42. ISBN 1-934110-32-9. ^ "I.A.5. Lee Harvey Oswald's Other Actions Tend To Support The Conclusion That He Assassinated President Kennedy". Report of the Select Committee on Assassinations of the U.S. House of Representatives. Washington, D.C.: United States Government Printing Office. 1979. p. 59. ^ McAdams, John (2011). "Not All Evidence Is Equal: Using Reliable Evidence". JFK Assassination Logic: How to Think About Claims of Conspiracy. Washington, D.C.: Potomac Books. p. 175. ISBN 9781597974899. Retrieved January 8, 2013. ^ a b Perry, James D. (2003). Peter, Knight (ed.). Conspiracy Theories in American History: An Encyclopedia (PDF). Santa Barbara, California: ABC-CLIO, Inc. p. 391. ISBN 1-57607-812-4. ^ Bonokoski, Mark (November 22, 1973). "JFK's magic lives on ... and some called it Camelot's Court". The Windsor Star. Windsor, Ontario,. p. 39. Retrieved April 14, 2012. ^ a b Herbers, John (November 26, 1963). "Slain Policeman Is Honored by Dallas". The New York Times. p. 15. ^ Ruane, Michael E. (November 21, 2013). "As he filmed, Abraham Zapruder knew instantly that President Kennedy was dead". washingtonpost.com. Retrieved August 15, 2014. ^ "Bells Toll for Officer Tippit". The Boston Globe. Associated Press. November 26, 1963. p. 10. ^ Janson, Donald (November 26, 1963). "Oswald Is Buried in Texas in a Wooden Coffin". The New York Times. p. 14. ^ Farwell, Scott (January 10, 2013). "Fundraiser set for oldest son of Dallas police officer killed by accused JFK assassin". dallasnews.com. Retrieved August 15, 2014. ^ Stone, Oliver (1992). JFK: The Book of the Film. Hal Leonard Corporation. p. 585. ISBN 1-55783-127-0. ^ Mottram, James (1998). Public Enemies: The Gangster Movie A-Z. Batsford. p. 163. ISBN 0-7134-8276-1. Myers, Dale K. With Malice: Lee Harvey Oswald and the Murder of Officer J.D. Tippit. ISBN 0-9662709-7-5. Wilkes, Jr., Donald E. (November 20, 2002). "The Rosetta Stone of the JFK Assassination?". Flagpole: 8. Archived from the original on March 14, 2012. This page was last edited on 13 March 2019, at 04:24 (UTC).